iSCSI is a technology designed to carry SCSI commands and data across an IP network. It enables a server (initiator) to send SCSI commands and data to a storage device (target) over a TCP/IP based network (standard LAN technology) in IP packets. The Broadberry iSCSI SAN CyberStore Data Storage Servers provide a fast, reliable and scalable platform for IP storage including NAS & iSCSI SAN. 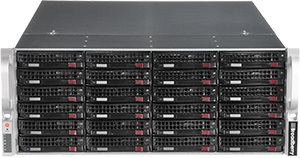 Whether you need it for file sharing, storage consolidation, backup and recovery, high availability, virtualization or local or remote replication - asynchronous off site data replication, the iSCSI SAN CyberStore Data Storage Server offers excellent price performance ratio, enhanced manageability and increased productivity. Broadberry provide a range of Pedestal and Rackmount NAS Storage & iSCSI SAN Storage Servers, scaling from entry level 1U rackmount units with 4 enterprise class hard drives up to 8U with 48 enterprise class hard drives based on Serial Attached SCSI (SAS) or Serial ATA (SATA) technology with 2TB (Terabyte) through 96TB capacities with expansion capabilities to over 1 Petabyte of storage that is centrally managed. Our fully redundant NAS & iSCSI SAN Storage Servers incorporate a choice of hardware RAID levels including RAID level 0, 1, 5, 6, 10, 50, 60 and JBOD, Gigabit Ethernet connectivity and optional Fibre channel and 10GbE connections are also available. Other features of the Broadberry NAS & iSCSI SAN CyberStore Data Storage Server range include Local and remote volume replication, duplication and snapshots including cross data synchronization of files and directories from one Storage Server to another (Local or Remote). Disaster recovery or disk to disk backup utilizes block-based data transfer to keep network traffic to a minimum. In todays world most companies have Mission Critical data, if your data is unavailable even just for a few hours - the costs can be substantial and far outweigh the cost of the IT equipment the Data is Stored on. High availability storage clusters were only available to the large corporations that had an endless budget thus not very popular in the medium and small enterprise markets. We are proud to offer the first solution that is designed for all sizes of companies from SME to Large Corporations. The high availability feature is built in to the Broadberry iSCSI SAN and NAS Data Storage Server at no additional cost. To create an automatic failover solution, you just need two of our CyberStore Data Storage Server Appliances and you are all set. Setup of the failover solution can be done by any IT Administrator within one hour (Broadberry technical help is always available by phone or email). And following the quick setup guide could not be easier (even for first time Cyberstore users). A basic diagram of each setup is below, please also see our iSCSI Volume Replication with Failover PDF for full details. The iSCSI SAN range of Storage servers are fully scalable to over 1 Petabyte (1000 Terabytes), just by adding additional Cyberstore DAS (Direct Attached Storage) Units. Expand up to 5 additional Cyberstore DAS units per SAS Port without losing any performance. 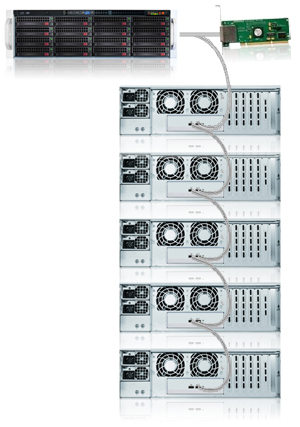 Each iSCSI SAN CyberStore Data Storage Server Appliance can have a Maximum of 6 External SAS ports, which in total can allow 30 additional DAS Units connected to the iSCSI CyberStore Data Storage Server giving over 1.4 Petabyte Expansion Capabilities, all Centrally managed by the single iSCSI CyberStore Data Storage Server Appliance. CyberStore DAS Units are available in 1U, 2U, 3U & 4U up to 108 Terabytes. The iSCSI SAN Data Storage Server web-based Graphical User Interface (GUI) makes remote management of the storage device a simple task. By using a web-browser, the Storage Appliance can be easily managed from anywhere within the network. The iSCSI SAN Data Storage Server is accessible and configured through a web-based, password-protected GUI over Secured Socket Layer (SSL) administration access. The iSCSI SAN Data Storage Server can be managed by using the console tool. For security reasons some advanced and critical administrator tasks like removing and restoring volumes and checking and repairing the file system, can only be managed from the console. Through the console tool, an administrator monitors the status of the network and memory usage, install drivers and hardware and perform other tasks. The server performance of the iSCSI SAN Data Storage Server can be increased by changing the settings of disk, network, file system or network using Tuning Tools. The iSCSI SAN Data Storage Server can be used with structured networks in business environments and has an optional data access via Intranet or Internet. The iSCSI SAN Data Storage Server supports usage of two or more network cards to access separate sub-networks or to increase the bandwidth and allows administrators to select services to be enabled on a specified NIC. To improve the data throughput and latency, the Data Storage Server supports 10 GbE to increase bandwidth, improve overall performance, and reduce message latency across connections. The iSCSI SAN Data Storage Server supports the most popular 10GbE cards with TCP/IP. The iSCSI SAN (Storage Area Network) Server supports InfiniBand cards that increase bandwidth, improved overall performance, and reduced message latency across connections. 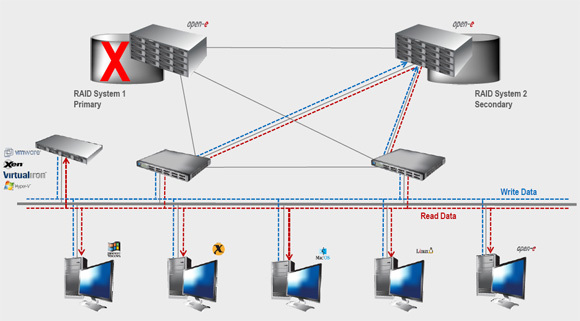 The iSCSI SAN Data Storage Server software allows the configuration of the Proxy Server for Internet connections. The iSCSI SAN supports the Secure Internet Protocol (IPsec). This protocol secures data transmitted across a network, preventing confidential and personal information being intercepted or modified. The iSCSI SAN Data Storage Server supports hardware iSCSI Initiators and has a software iSCSI Initiator for easily expanding the storage capacity of the NAS server. New units and logical volumes can be added by connecting an iSCSI storage system to the NAS server. The iSCSI SAN Data Storage Server supports Serial Attached SCSI (SAS) and Serial ATA (SATA) controllers of all leading hardware RAID controller manufacturers. 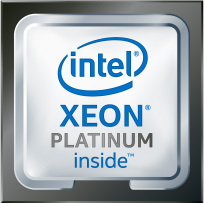 The integrated hardware RAID 0, 1, 5, 6 provides more flexibility while creating the best performance storage solutions. By mirroring two hardware RAID arrays, the probability of failure can be reduced. The iSCSI SAN Data Storage Server offers highest flexibility in redundancy, performance, costs and storage volume. Email alerts are sent to the system administrator in case of issues with the RAID through the iSCSI CyberStore Data Storage Server software. The iSCSI SAN CyberStore DSS software includes S.M.A.R.T support for detecting and reporting the status of the Hard Disk Drives (HDD) anticipated on failures. Email alerts are sent to the system administrator in case of HDD problems through The iSCSI CyberStore DSS software. For higher bandwidth, better latency and performance, The iSCSI SAN CyberStore DSS version supports Fiber Channel HBA's from Emulex, Qlogic and LSI. Fiber Channel is the standard connection type for connecting high speed storage devices much like The iSCSI SAN CyberStore DSS, to computers in Storage Area Networks (SAN). The iSCSI SAN Data Storage Server supports logical volumes greater than 2TB and a physical size of up to 16TB in 32bit mode, and unlimited in 64bit mode (Maximum size of Appliance). The iSCSI SAN CyberStore Data Storage Server supports Multiple Snapshot with Scheduling to create snapshots at predefined points in time (e.g. automatically every hour). Logical volume groups allow storage administrators to create logical storage pools that span multiple physical disk drives. With support of multiple logical volume groups, the iSCSI SAN CyberStore DSS makes it easier to meet the changing needs of users and applications while making the maximum use of available physical disk space. The iSCSI SAN Data Storage Servers RAID controllers expansion capability supports the increase of size of existing units without removing data. 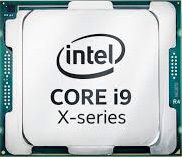 The iSCSI SAN CyberStore Data Storage Server monitors hardware status such as temperature, voltage and fan speed provided by the motherboard's sensors. The iSCSI SAN CyberStore Data Storage Server uses SNMP for monitoring data throughput, Central Processing Unit (CPU) and Random Access Memory (RAM) usage to name a few. The iSCSI SAN CyberStore Data Storage Server log file is an effective instrument in analyzing and solving technical issues. The iSCSI SAN CyberStore Data Storage Server supports up to 2 CPUs (Mulit Core) to increase the I/O throughput for heavy duty data requirements. Large number of processors (upto 32) are possible with a custome rbuilt solution - please call for more details. The iSCSI SAN CyberStore Data Storage Server is capable of using the Simple Network Management Protocol (SNMP) interface for communication with other SNMP-enabled servers (e.g. CyberStores) for a smooth server shutdown in the event of a power failure. The server with the UPS sends a power failure signal through the network to other servers (in slave mode) and will shut down all servers in the network. The iSCSI SAN Data Storage Server supports Windows Active Directory (AD), Primary Domain Controller (PDC), Lightweight Directory Access Protocol (LDAP) and AD & NIS User-/Group ID synchronization to leverage information about users, groups, systems and other resources stored in the Active Directory. The support of Access Control List (ACL) ensures that access rights of users are automatically taken over from the Domain. The iSCSI SAN Data Storage Server supports NIS for easier and consistent access of information stored on any other data storage server using NIS directory service protocol by enabling distribution of system configuration data such as user and host names between computers on a computer network. The iSCSI SAN CyberStore Data Storage Server has an integrated Antivirus software tool for scanning shares on viruses at predefined points in time. 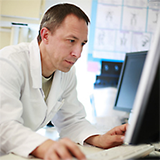 The Virus Definition Database can be updated and is stored on the NAS device. USB Units connected to the iSCSI SAN CyberStore Data Storage Server can be used as a Dynamic Units which can be easily used for local backups. The iSCSI SAN CyberStore Data Storage Server backup agents help administrators to backup and protect data on NAS servers with backup software from Veritas, Dantz, or CA BrightStor ARCserve thus improving data transfer, network security and real-time directory browsing, monitoring tasks and supporting cross-platform backup support. The iSCSI SAN CyberStore DSS supports the file based protocols CIFS (Common Internet File System)/SMB, NFS (Network File System), FTP (File Transfer Protocol), FTPS and Apple Talk enabling Windows, Linux, Unix and MacIntosh clients to share data on the same server. The iSCSI SAN CyberStore Data Storage Server supports external LDAP enabling administrators to configure and manage multiple data storage servers from one single point (either a Broadberry CyberStore server with a LDAP database or any other LDAP server). In The iSCSI SAN CyberStore DSS, CHAP users can be assigned to a specific iSCSI target. CHAP is an authentication schema, managed by user name and password, to validate the identity of users to manage the access rights of users to targets. The iSCSI SAN CyberStore Data Storage Server allows set multiple connections to one target increasing performance and reliability. Data is safe thanks to the iSCSI SAN CyberStore Data Storage Server volume replication feature creating an exact copy of source volume in real time. In the event of volume disaster, data on destination volume remains intact. SWAP is used to store memory areas on hard drives instead of Random Access Memory (RAM). 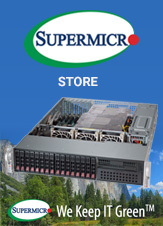 The iSCSI SAN CyberStore Data Storage Server software dumps memory to SWAP in case of additional memory is need (e.g. repairing the file system after a degraded RAID). The iSCSI SAN CyberStore DSS supports single, dual, multiple or pyramid LCD display configuration. Regardless of the number of users connected to the storage device, The iSCSI SAN CyberStore Data Storage Server license schema is a one license per DSS and is priced accordingly. Whether you have 5, 500, 15,000 or more, you only pay one price for one Data Storage Server License. A Superuser account has unrestricted access to all the files and volumes and is an especially helpful feature when certain directories or files are no longer accessible. Through The iSCSI SAN CyberStore Data Storage Server, a local HDD or a USB drive can be defined as a Dynamic Unit and acts like a normal tape drive which can backup the NAS server and be removed without shutting down the server. The iSCSI SAN CyberStore Data Storage Server synchronize files and directories from one NAS server to another. Disaster recovery or Disk-to-Disk backup synchronization utilizes block-based data transfer that minimizes network traffic. DSS can synchronize data in both directions: the DSS can be the source and destination of files at the same time, allowing to cross-backup data on several servers. The iSCSI SAN CyberStore Data Storage Server allows set up password for iSCSI targets to protect them from unauthorized access.